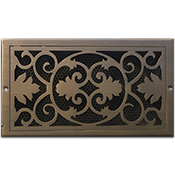 This bronze vent cover is handmade with a 1/4" thick faceplate in order to give it strength and durability. Our Victorian register is equipped with a metal diffuser to allow for complete airflow control. Choose your bronze vent cover to come in either a light, dark or antique patina which is hand rubbed, ensuring a quality finish. Our Victorian register is also made here in the United States with a sand cast mold, making this vent one of a kind. Because this bronze vent cover is made from solid material, it is strong enough to be used in the floor, as well as in your ceiling or wall. If installing the Victorian register onto the wall, pre drilled screw holes and screws will come with the order for easy mounting. If the bronze vent cover is being used in the floor, choose to have no screw holes to allow a simple drop in installation. Have all your Victorian registers ship at once to save money and time. 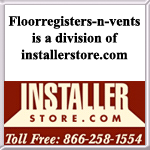 Tip: Bronze vent covers are listed above according to the measurement of your ductwork opening. The 14 x 14 Victorian registers will drop into a hole opening of that size. Outer dimensions will have an additional 2 inches added. Overall size can vary from vent to vent since they are hand made. Important: Classic Grilles bronze vent covers are considered special order, non returnable items which cannot be canceled once an order has been placed. The Victorian registers will ship 7 to 9 weeks after your order has been placed. Find bronze vent covers in other designs on our site which are also made in the United States. Our Victorian register is also available as a cold air return which has a screen backing instead of a damper. Improve your home with bronze vent covers which will allow air to flow when you need it. Order now.